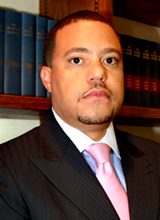 Thomas T. Dean, a native of Long Island, Bahamas, was raised and educated in the City of Nassau until commencing studies abroad at the University of Windsor/University of Western Ontario and City University in Canada and the United Kingdom, respectively, whilst remaining a Private Banker for a number of Swiss Banking & Investment Firms. Upon completion of the Bar Vocational Course at Inns of Court School of Law in London, Mr. Dean was subsequently called to the Bar of England & Wales by the Honourable Society of Lincoln’s Inn and the Bahamas Bar in 2005 and the Bar of the British Virgin Islands in 2007. Mr. Dean joined Dupuch & Turnquest & Co. as an Associate in 2007 and focuses his practice on Trusts and Estates; Asset Protection; Providing Family Offices and Protectorships; International Wealth Planning; Commercial Real Estate Acquisitions and Conveyancing; Commercial Real Estate Development; Seabed Leases; Joint Ventures; Corporate Law; Mergers, Acquisitions and Divestitures; Salvage Rights and Agreements; Yacht Registration & Maritime Law; Charter Parties; Government Relations; Lobbying; Financial Services Law; Direct Foreign Investment; Hotel Leases and Management Agreements; Hotel and Resort Development; Fractional Program; Casinos and Gambling and Commercial Litigation. Mr. Dean is a married father of one. He is a licensed captain, avid boater, salvor and sport fisherman in his spare time. Mr. Dean is also bilingual and remains a fervent world traveler and conservationist.